Thank you, Chibuzor. You are blessed in Jesus' name. Lovely poem with lessons in it. Well done Ma. Thank you, Loveth, and have a blessed week. Nice poem with an interesting message. Thank you, Cynthia. You are blessed! Its true what the poem says but sometimes, you may not even take all these signs serious. like, its kinda hard to deal with. Really hard, my dear! I wasn't being flippant. Just presenting one way of looking at this type of situation. You're right. But mutual love is one of the sweeter things in earth. Cheers! And one should decide how long he or she is going to put up with it. Bless you, my dear! i think the poem is talking to those guys in relationships and those hoping to be.I feel as though your advicing us to take time to talk things through whenever we have disagreements with our spouse, lovers or boy/girlfriends. It's a poem that talks, commendable! It's about unrequited love. Thought that came through lucidly. Anyways, that would be some years yet for you. Nice to focus on your studies for now. You are blessed! This poem is realistic.Mostly in Nigeria, love here is one sided. the best solution is to cheer up and live your life, forget about people that don't care about you. I just can't stop loving your poems. Wow, such a lovely and encouraging comment. You are lifted, Tochukwu, my dear! Everyone deserves to be loved back. And I pick the strength from this poem to leave if I ever come across such unrequited love. This is just wow ma. God bless you, Chiamaka! But note that you try to make it work first but when it gets harmful as in the abuse in the third stanza setting in, then it's unwise to stay. Nice poem, it is really educating but i am not comfortable with it. it really throws me off balance to see people go out of their way to do things for others and they are depised by those they love. it is really unfair. That's the whole point of the poem, Chika. No one should go into slavery in the name of love. At least, that's my point of view. Bless you! That's a good one. Good advice!! I'm glad you think so. Cheers! Only when it's not mutual or it's inappropriately expressed. Cheers! what a wonderful poem with an interesting advice. Glory to God! You are favoured, Blessing! "When everyone else is deemed better than you", this is the stream I see myself in currently and am left with this, "When hope is all you’ve got to show." I wish i would wake up right now and realize this is all a dream. Great poem, I see myself in it. if a person is in a relationship along the line you find out that things are not going on as planned, the only solution is to backoff. i wish most Nigerians can read this poem. You can try to make it work for a while but when someone becomes abusive and unfaithful, you're hurting and risking your life to stay. My point of view, though. Cheers! very educative. ma, you are doing a great job. This is mostly referring to those who love some persons that do not care about them. They end up being hurt. Love shouldn't be a one-sided thing, it should be reciprocated. When you notice the above mentioned, you sit and talk. I really love that. I feel we should not just give up. After trying to talk things out, if it does not work, then your leaving is justifiable. Nice one, Ma. I really learnt a lot from it. Nice and educative poem. This poem teaches us how to survive in a relationship. when things are not moving well in a relationship, the couple should try and talk it out. But if the relationship still seems to be sinking, the best thing to do is walk away. Nice poem Ma, it is really not good to live without stopping sometimes to check how you live your life. Likewise, it is not proper to continue sticking to those that don't love you because they will only keep you frustrated. Ma, I appreciate every one of your write-ups. They are amazing! Thank you for your kind words, Gloria! God bless you richly in Jesus' name. That's right. What a happy place the world will be if love were mutual in every relationship but unfortunately it's not always like that. Bless you! This poem is absolutely right. When you've tried to make things work and you see they are never gonna work out, it's just best to leave. Right, because if you kill yourself by remaining in an abusive relationship, your partner will move on. Best to stay alive and both of you do that. yes! stand up and walk away from that love that does not put a smile on your face, walk away from that love that brings you pain, you are better off without that person! When you give it your all and receive the worst, rather than drown in the sea of pain, you need to stand and walk out the door. I believe so too! Nice angle to this whole concept of loving and reciprocating. Thanks a whole lot, Chianaka! This poem is trying to explain that when you've tried the best you can to love someone and do things to please them, you shouldn't keep forcing it if the person shows no sign of giving in. Love shouldn't be one sided, both parties should have mutual understanding and love for each other. Love should be reciprocal. Love is real happiness, and not a whip of pain. When you see yourself on the fence wondering whether to let go or not, do it and have peace of mind. God will grant you a better person. True love is hard to get. True love respects feelings and sees reasons. Nowadays, young people mistake lust and infatuation for love. This is what leads to heart breaks. People should be relationship-wise to avoid heart breaks. Love is good but whenever your partner starts to do something you don't like, you have to quit. Something... anything? Like slurping their drink or farting in their sleep? Lol! Its easy to fall in love but hard to walk away without anybody being hurt. What should we do? Remain there to be hurt or walk away to hurt others? Who says the purpose of walking away is to hurt others? There's gotta be a better purpose in life than going around inflicting hurt in the name of love. this situation is usually rampant these days. love should always be reciprocated, don't waste your time with someone who doesn't know your worth and appreciate you. nice work ma. Hmmm, love is a nice thing but it pains a lot to love without being loved back. when you try all you can to make things right and it does not work, the best option is to walk out the door. 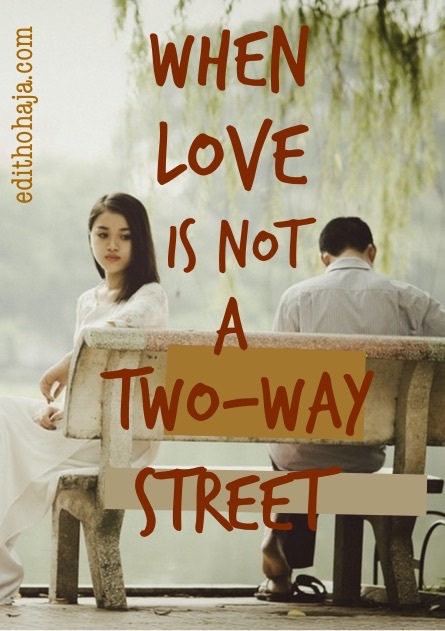 The poem has a nice command of style as repetition is used to make emphasis on the title"when love is not a two-way street". The poem depicts that in any relationship that there is no common agreement and your value is debased, you sit and talk out things with the other person. When no headway, walk out. love should be a mutual understanding between persons. whenever a quarrel arises instead of throwing curses or keeping malice, they should sit down and iron it out. love ought to be reciprocal.sometimes in life we have to love ourselves more and call it quits. Dont dwell in unrequited love. This love was just potentially structured with a big lesson in the last line of stanza and it said You need to sit and talk things out ,.that is when things goes wrong you need to talk it out. A love unreciprocated hangs on air. A positive response to love strengthens it. Love is precious and should not be ignored. But if otherwise, do as the poem said. Ilike that. Bless you. When a love is not noticed by the loved, it turns to restlessness. If the love is very strong, it goes into confrontation. But I prefer the poems admonition, " you need to stand and walk out the door". Well done mum. This piece emphasizes the need to bring to an end unions that sap one's mental, emotional, and spiritual energy and finally nothing is recieved or reciprocated for what has been offered. Symbiotic relationships should be encouraged and parasitic relationships be shunned or done away with. Good one, Emmanuel! Like the resort to biology. Symbiosis and parasitism are perfect illustrations of what the poem is talking about. yeah, working out of the door is easy 2 say but hard to do. but since it is the right thing, lets do it when the time comes. This poem is really touching. Why should one even think of making one's life miserable and uncomfortable. People should always try to appreciate what others have done for them and not to pay them with evil deeds. most times moving on is rather said than done. A very inspirational poem, ma. Yes ooo! Some couples have experienced what you clearly stated in your poem. I pray i'd never have to experience it-the thought of having a cheating spouse- it's really heartbreaking and frightening too. I concur with the belief that one has to leave to preserve his/her sanity as soon as he/she discovers that he has a cheating spouse. Love is a nice thing but when your feelings are being looked down on, the best option is to quit. A true love must respect feelings. This poem is really consternating, because many people in the society have been doomed with this word called "love",for instance one maybe deeply in love with someone, not knowing that he/she is fooling himself/herself because he/she may sacrifice everything he have in order to please or satisfy the one he or she claim to love but after everything he/she may end up getting hurt.We can see this in stanza one,line three and four "When tears become the food you eat You need to pause and think again". Wow, the mysteries of love! Love is a wonderful thing but sometimes it hurts. The poem brings out that other side of love. This poem examines the fact that a lot of people tolerate a lot of things they shouldn't all in the name of love. But love is a good thing, not torture so we should know when to say no and walk out. Something better is on the way! This poem is trying to tell us that one shouldn't be blind in love in order not to be hurt. It is good to be in love but one should be careful when failing in love in order not to be heart broken. Wow! A simple poem but deep. With just three stanzas, the poem expounded on the down side of relationships. It tells us how to handle things when they seem to go awry. So many of us are not really accustomed to walking out of a relationship that once had a thriving love. It is not always easy because in the traditional African setting, we have been taught to stick to relationships. However, it is advisable and even healthy to leave such relationships if they turn out to be parasitic. This poem is a masterpiece. The last stanza carries a very strong message. When the one i love doesn't value my love for him and treats me like some piece of trash, though it may not be easy, the best thing to do is to stand and be strong I am more than that, the best is yet to come. KEEP THE GOOD WORK UP. THE LORD IS YOUR STRENGTH! BEAUTIFUL! When the relationship is no longer working out, simply quit it. Indeed when love is not a two-way street. Love should not be one sided, there is this joy one feels when it is reciprocated. It is not just talking of our relationship with people but also with God. God loves us and allowed his only Son to die for our sins and we should reciprocate that love for a complete match. No matter how tough it gets, you need to stay strong and hold on to the little hope you have left. unrequited love is truly slavery so you need to stand and walk out the door. this is very nice ma. Love is not a two way street indeed, it requires everyone working at it and not easily giving up at the slightest provocation. Is really an educative poem. Understanding and trust are keys to a blissful relationship, but when the issue in a relationship is beyond understanding, just walk out the door. Its really not easy to deal with when love is not a two-way street, but one has to decide anyway, because, its got to be a two-way street! Thank u ma for this wonderful and educative poem. Am so happy i learned a lot from it. yes, love is food for the soul but we should love with our head not our heart. Is that possible? We may try to reason some things out but emotions can't be ruled out. We truly need to sit and work things out when things are not going straight or when there are issues that have created barriers between couples. It really helps. this poem is emphasizing on one sided love, love is wonderful when it is reciprocated. i am truly encouraged ma God bless you. This basically talks about relationships that are one sided. It also says we should avoid such relationships in which just one person seems to be putting in all the effort just to make it work - it is a pure waste of time and will amount to nothing.